The Wounded Warrior Project winning bid was $1002.00 by Robert Leath. Thank you for your generous bid. This is for archival and collector's information because these pistols are no longer made. Originally made for jump shooting rabbits in heavy brush, where in one or two hops a wounded rabbit would be hard to find. A .375-diameter (3/8") 84-grain ball anchors a rabbit on the spot. I have also used Crosman 1100 shotshells with #9 and #12 shot (reloads) to flak airborne carpenter bees; they were burrowing holes in walnut planks I was drying. I also found #8 shot to dispatch snakes. The shot pistol uses a Crosman 1100 shotshell in a smoothbore barrel. Shot or a .375 lead ball can be loaded in the shell casing. The general pattern is a bolt-operated telescoping barrel. The shotshell is used as a breech seal and is used with both shot and ball; as many as 25 shots at a velocity of 280-310 f.p.s. could be had from a 12-gram powerlet. The breech is numbered, starting with #250 through #386. The number is on the back of the breech. The first pistol was made in May 1995 (displayed at the Little Rock Airgun Expo) and first offered for sale at the Winston-Salem International Airgun Expo in October 1995. I made 9mm (.356) rifled pistols intended to use cast lead .380 ACP bullets. But I found that the bullets available from the makers were too hard, using too much energy to engrave the rifling on the bullet. The four I made are bolt-action "L" slot and are simply marked A, B, C and D. 9mm conversions were also done on the 2240 frame. 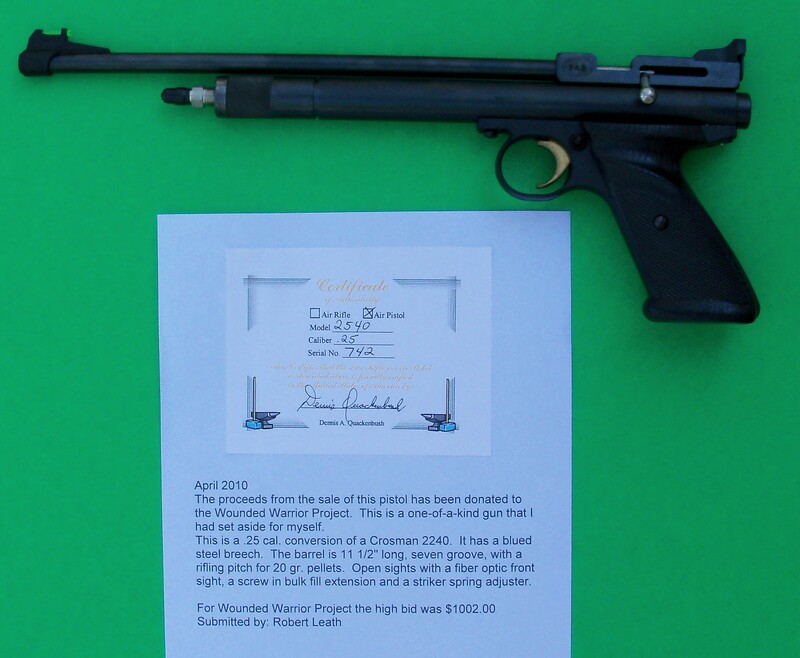 I only made one shot conversion of a Crosman 1300 pump pistol. It is #1301. The total number of all types and combinations is 185. The first pistol made (#250) was tested by "The Airgun Letter" in the June 1996 issue. Test by "The Airgun Letter" had an 8" barrel. Others have approx. 11" barrel, improving velocity. The pistols were advertised in "Airgun Ads" and sold for $125 to $130. I stopped making the conversions when Crosman discontinued the SSP-250, and the supply of pistols stopped. 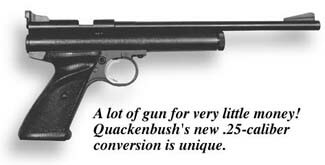 Quackenbush makes a .25-caliber pistol! These pistols are no longer available. It never fails - a new air pistol comes to market and within a month people are clamoring for it in .25 caliber. I don't know why this is, but it is. Well, Missouri-based airgunsmith Dennis Quackenbush decided to get ahead of the power curve this time by offering the Crosman 2240 CO2 pistol in .25 caliber. And, what a pistol it is! Dennis has installed his own machined steel breech, steel bolt and rifled steel barrel. This removes many of the objections concerning plastic parts on the new gun. Weight is 36 ounces and it feels very solid in the hand due to Crosman's sculpted ambidextrous grips. The 10-inch barrel is button-rifled by Dennis in his shop. He has free-floated it above the CO2 powerlet tube, giving it a look of delicacy; but in the hand, the gun is anything but delicate. Very little barrel flex can be detected, even with a stout squeeze of the hand. This no doubt helps the accuracy, which is considerable, to say the least. More on that in a little bit. The barrel is rifled with seven lands in a right-hand twist of one turn in 18 inches. Dennis tried several different twist rates while testing the gun with the Diana Magnum .25-caliber pellet, which he wanted to shoot exclusively. The Diana Magnum is a domed 20-grain pellet, which makes it on the light side for a quarter-inch bore. It has always been one of the two most accurate pellets in any .25-caliber airgun we've tested. The Beeman Kodiak is the other. But Kodiaks weigh 31 grains in .25 caliber, and thus must be driven almost twice as fast as the Dianas to stabilize. They are fine for Theobens, Careers and other magnum air rifles but far too heavy for most air pistols. The Diana Magnum, on the other hand, is ideal. It provides both punch and splendid accuracy. When shooting, you encounter a phenomenon seldom seen in an air pistol. The recoil is so pronounced that the barrel climbs before the pellet leaves the muzzle. Coupled with the position of the grip, which sits close to the center of gravity, this is enough to cause the gun to throw its shots high at 10 meters. It's something you have to take into account when shooting a .45 Colt with a long barrel, but you seldom see it in an airgun. Our test gun was shooting three inches high at 10 meters but exactly on the centerline. 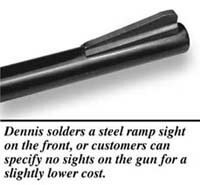 Dennis has already addressed this issue in the production guns by lowering the mounting base of the rear sight. Optical sights are also possible, and I would think they'd be the sights of choice. The receiver is grooved to accept airgun dovetail mounts both behind and in front of the loading port. Since there's no harsh recoil, a scope stop is not needed. I seldom approve of optics on handguns, but this pistol is the exception. It has the power and accuracy to fully utilize optics, plus the range can be extended if a telescope is used. My personal choice would be one of the new inexpensive but high-quality dot sights from Compasseco, or perhaps that new Crosman model. 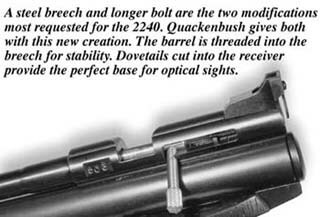 The 2240 is already a popular pistol, so Quackenbush's modifications have a good starting point. I got 30-35 good shots from a single powerlet, which is great when you consider all the power this gun generates. I tested it on a cold range, so it should do even better where it's warm. I would really like to see him bring it out in a 16-inch barreled version with a walnut thumbhole stock. It would weigh around 3-1/2 lbs., like the Sharp, but would have a bit more horsepower at the muzzle. For the time being, you can pick up a detachable stock from any Crosman dealer and turn this gun into a mini-carbine. Coupled with a good red dot sight, the combination should be devastating! Extreme spread - 21 f.p.s. Standard deviation - 6 f.p.s. Muzzle energy - 8.64 ft.-lbs. The pistol came with Crosman's standard trigger, which Dennis invited me to clean and lubricate. There isn't much to the job. Just loosen two grip frame screws and separate the grip from the rest of the action. The sear is in the grip and can be easily accessed this way. Unfortunately, it is so simple that there is very little that can be done to improve it. I measured the pull on our test pistol at 4 lbs., 5 oz. It's a single-stage pull and very creepy. Moly didn't seem to help much. The pull could have been lightened by cutting a coil off the trigger return spring, but as this gun was on loan, I didn't try it. The trigger blade is quite thin, which makes the hard pull seem even harder. In the frame just behind the triggerguard is a crossbolt safety that works perfectly. If you do decide to look at the trigger's innards, be very careful not to lose the tiny coil spring and ball bearing detent that hold the safety. They are in a tiny hole in the grip frame. The single powerlet that drives this airgun is housed inside the larger tube below the barrel. You drop the powerlet into the tube neck-first and screw the cap tight. The powerlet seals on the flat tip of the neck, and we never heard the smallest puff of gas the whole time we had the gun. An advantage of this type of arrangement is that you can unscrew the cap to dump the remaining pressure at any time. The reservoir does not hold any pressure, so the cap always turns freely. Our feeling about this remarkable pistol is this: How does he do it? Dennis is buying a new 2240 and converting it to what we tested for the incredibly low price of just $125 with sights or $115 without. He even makes his own barrels, which are first rate. Most owners want a steel receiver to begin with-here you not only get that, you get it in .25 caliber! Our thanks to Dennis Quackenbush for the loan of this pistol to test. He plans to make a run of 60 pistols of this configuration, so you'd better get your name on one now. These inexpensive pistols of his tend to sell out in a few months, at best. You can contact him at 417-993-5262, Central. Pro - Well made, all modified parts are steel, very accurate, quite powerful for an air pistol, receiver grooved for optical sights. Con - Crosman trigger is stiff. Cost - $115 without sights, $125 with sights retail. This is for the complete gun, as tested. Availability - Order direct from Dennis Quackenbush at 417-993-5262, Central. Guns are produced in a single lot and may not be available for long after they go on sale.